It’s been quite a while since people were able to set foot on Pasque Mountain. Consequently, the trail through the cutblocks is growing in and hikers new to the area are going the wrong way. The proper trail needs to get its tread back! So here are directions from Hwy. 940. 8.5 km south of Cataract Creek bridge turn right onto the original Forestry Trunk Road/logging road/snowmobile trail. Park on the left side. Walk along the road to the bridge-out over Wilkinson Creek. Wade across using the original ford to left. Back on the newer road, turn next right as per the yellow sign onto a logging road/snowmobile trail. Update Dec 2014: The bridge at the tributary crossing, washed out by the 2013 flood has been replaced. At a cairn at 717642 turn left and pick up the trail starting between two small flagged trees. It heads south through a grassy passageway with a few small trees, staying at the left tree edge, and is generally clear. On entering a large cutblock, keep on the same line. Initially, the trail is hard to follow in soggy grasses, but improves past the sawmill site. Some flagging precedes another stint at the left edge of trees. Start of the trail from the first meadow. At a cairn at 713635 head left down a grassy avenue — an exploration road reduced to single track — and cross a small creek. The trail up the far bank is good, then fades en route to a tiny creek crossing with flagging. On the far side are long grasses and it’s here where people are going wrong, carrying on south when they should be heading southeast. The correct route is now flagged and heads downhill into another avenue between trees where the trail is clear. Cross another fork of the tributary below open slopes. The first couple of km onto the ridge. GPS provided. The exploration road winding up onto the ridge ahead is covered in grass and flowers initially, but the line is obvious and once on it you can follow it all the way to the north end of the summit ridge. The route to the summit of Pasque Mountain. Got so lost the first time we did this one. I don’t think we ever did make the summit. 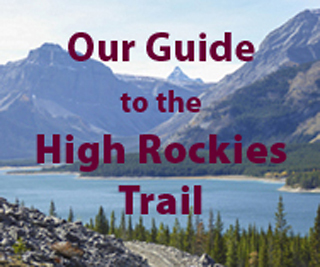 Thanks for constantly getting out there and providing up to date trail reports and routes. Always appreciated.